Dramatic scenes today at Stage 3 of the Tour following a major crash with just under 60 km left to race, which at first neutralised the action before suspending the race completely for a few minutes. Such were the demands placed on the medical services in the wake of the crash, featuring around 25 riders, that the organiser deemed it unsafe to continue the race without adequate medical cover. Despite the carnage it seemed some wanted to race on throughout. Four riders Gerrans (OGE), Bonnett (FDJ), Dumoulin (TGA) & Kozontchuk (KAT) were unable to continue – others managed to recover enough to rejoin the bunch but they soon dropped off the back when the race re-started. Last man on the road today was a battered Matthews (OGE) @ 21.38, who seemed to be suffering badly. The yellow jersey wearer, Cancellara (TFR) lost almost 12 minutes and on several occasions looked like he would have to retire, appearing to be suffering the effects of concussion – Eurosport GB reported. Rumours abound that Ten Dam (TLJ) suffered a dislocated shoulder, but had it popped back in before continuing. Respect. 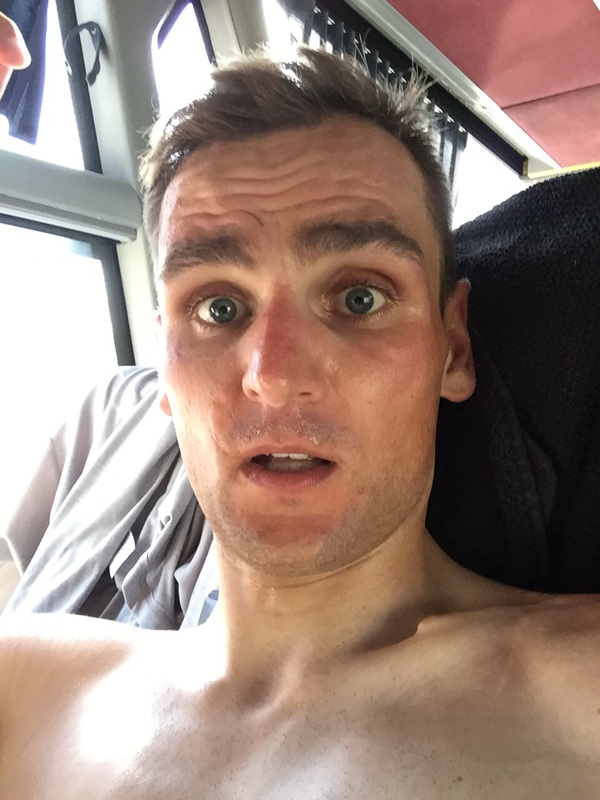 Vossi was following closely towards the front of the peloton at the time of the crash and just managed to avoid hitting the deck – the first rider in the line not to go down. However, he hit his knee on the stem of a flying crashed rider’s bike in the process of trying to avoid the mayhem and suffered to the finish with a swollen knee. The selfie he sent us tonight represents his face as the crash happened directly in front of him. He told us for the second day running – ‘happy just to get around’ – with teammates also surviving the day having “only lost some skin”. His message for the peloton tonight: RESPECT EACH OTHER. Sure there is a time for hard racing – and that’s what we all love to see – but not at any cost. In his post-race interview Marin (OGE) seemed to echo this sentiment. When asked if he was sorry to miss the the yellow jersey by 1 second he replied that he would not want the jersey under such circumstances as occurred today and that today he was proud of his colleagues in the peloton who stayed together – perhaps suggesting there was some discontent that others tried to take advantage of the carnage. The action continues tomorrow with further reference to the Great Classics. The vibrations from a sequence of cobbled secteurs of the Paris-Roubaix are sure to test to the limit those who are suffering the after-effects of today.